Soils are made up of four basic components: Sand, Silt, Clay and Organic Matter. Basic information about their make up in your soil can be found in the Soil Survey, but you also need to know how they can affect your soil. Organic Matter (OM) is made up of dead and decaying plants, animals and microorganisms. OM is a repository of nutrients that are released into the soil and it decomposes. OM also has a large water holding capacity, which helps retain moisture in soils during times of drought. Primarily organic matter is found at the top and in the uppermost layers of the soil profile, where most root growth occurs. Sand and silt are broken down bedrock, so they usually reflect the bedrock, or parent material, found below the soil. Sand is the largest soil particle at .05 to 2 mm. Anything larger than that is considered to be gravel and stones. Sand, with its large diameter and low surface area to volume ratio, allows water to drain right through and does not have the ability to hold onto many nutrients. Beaches are great examples of pure sandy soils. Have you ever noticed that few things grow at the beach? Plants that grow in sand are specially adapted to do so. Silt is the middle soil particle at .002 to .05 mm. Silt is commonly found in waterways and floodplains. With some water holding capacity and some nutrient holding capacity, silt is part of a good soil mix with moderate drainage and nutrients. Clay is different from sand and silt in that it is made up of silicon, aluminum, and oxygen. It is the smallest soil particle at .002 mm or less and has a very high water holding capacity and a high surface area to volume ratio enabling it to be a very good nutrient holder. Soils that hold water often include a lot of clay, and many plants are specially adapted to live in high clay soils. The ideal soil is considered to be a loam, which is a mix of sand, silt and clay. Loams take advantage of the balance of water holding and nutrient availability between the three. Loamy soils with high organic matter are very well suited for high demand crops such as vegetables and fruit. Soil structure refers to the shape of the soil clumps in any given soil. Soil structure is an important factor for water drainage through a soil and the suitability of a soil to hold structures etc. Detailed soil structure information can be found in the Soil Survey. 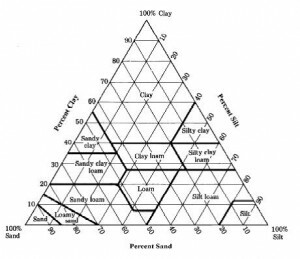 Pay attention to the suitability charts which outline potential uses for your soil.